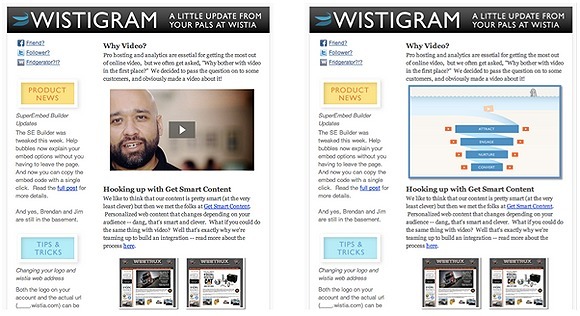 In our recent feature, we talked about how email is a great tool for video promotion. Now, we’re going to take a look at the video + email equation from a slightly different, but complementary, perspective: how video has improved our email marketing efforts. What’s the goal of our email marketing efforts? We are constantly monitoring open rates, click-through rates and unsubscribe rates (in addition to qualitative metrics like comments on the blog, Facebook, email responses, etc) to evaluate how well we’re doing. We’ve always included lots of videos in our email newsletters and we’ve seen those getting the bulk of the clicks — usually 50–80% of clicks (the same experience that MailChimp had). But a couple months ago, we decided to be a little more scientific to see just how powerful video is for increasing engagement. We did a split test using two identical emails with identical content, except one had a video as the top piece of content and the other had an illustrated graphic. The click / open ratio (# of clicks / # of opens — this factors out any variation in open rate between the two emails, which should have been identical because there was no indication of difference until you opened the email) for email a with video was 38%. Without a video was 12% … more than 300% improvement! Video is quick (if you have a track record of making concise videos, which we do). Video is a break: sit back, relax and watch this thing right quick. Video is mobile friendly: on average, 15 to 20% of our recipients are on mobile devices. It’s easier to watch a video than read a bunch on a tiny screen.